As you look through enrollment options for 2019, remember to look back on 2018. Check out your spending on procedures and prescriptions, and which providers are in your network. Friday, April 27, the Internal Revenue Service (IRS) announced that the 2018 annual contribution limit to Health Savings Accounts (HSAs) for persons with family coverage under a qualifying High Deductible Health Plan (HDHP) is restored to $6,900. The single-coverage limit of $3,450 is not affected. This is the final word on what has been an unusual back-and-forth saga. The 2018 family limit of $6,900 had been announced in May 2017. Following passage of the Tax Cuts and Jobs Act in December 2017, however, the IRS was required to modify the methodology used in determining annual inflation-adjusted benefit limits. On March 5, 2018, the IRS announced the 2018 family limit was reduced by $50, retroactively, from $6,900 to $6,850. Since the 2018 tax year was already in progress, this small change was going to require HSA trustees and recordkeepers to implement not-so-small fixes to their systems. The IRS has listened to appeals from the industry, and now is providing relief by reinstating the original 2018 family limit of $6,900. Employers that offer HSAs to their workers will receive information from their HSA administrator or trustee regarding any updates needed in their payroll files, systems, and employee communications. Note that some administrators had held off making changes after the IRS announcement in March, with the hopes that the IRS would change its position and restore the original limit. So employers will need to consider their specific case with their administrator to determine what steps are needed now. May not be claimed as a dependent on someone else’s tax return. Limits apply to HSAs based on whether an individual has self-only or family coverage under the qualifying HDHP. *If the HDHP is a nongrandfathered plan, a per-person limit of $7,350 also will apply due to the ACA’s cost-sharing provision for essential health benefits. The age-old adage, “you get what you pay for,” certainly holds true in the stop loss industry. I cannot stress enough how important it is to look at more than just the premium rates on a spreadsheet. To understand the importance, let’s use the auto insurance industry as a comparable example. If you were purchasing car insurance for yourself, would you always accept the lowest price without doing a coverage comparison? How would you know if that insurance company might jack up your rates on renewal, or once you have an accident, or possibly delay your claims and find every reason or loophole not to pay them? Apply that same thinking to stop loss coverage with larger dollar amounts at risk. Not every stop loss policy is alike and not every carrier is going to provide you with the coverage you are seeking. As an employer, you want to make sure the employee benefit plan you sponsor for your employees will not result in any significant liabilities for your company. You want the peace of mind of knowing there won’t be any surprises along the way. All stop loss carrier policies are different. Over my 20-plus years in the industry, I have seen some very unique language and provisions in stop loss policies that most people would not notice without looking at the fine print. You must be aware of these potential provisions that could cause significant gaps in coverage between your employee benefit plan and your stop loss policy. How can you best protect your company? You can start by working with your broker or administrator to narrow down the list of stop loss providers to those that best meet your needs. Brokers and administrators are best suited to understand the complexities of stop loss insurance and provide you with the best possible information regarding policies and choices. By keeping this, and the following items, in mind during your selection process, you should be able to find a carrier to serve your needs. Additionally, there are a few other things you will want to look for, or ask about, when selecting a stop loss carrier. In part two of this blog, which will be posted the first week of April, I will discuss some of the most frequent items I have seen that cause issues or gaps in coverage. If not for PACE, the mid-size segment would have become subject to the ACA provisions that impact small employers. Included in these provisions is a mandate that requires coverage for essential health benefits (not to be confused with minimum essential coverage, which the ACA requires of applicable large employers) and a requirement that small group plans provide coverage levels that equate to specific actuarial values. The original intent of expanding the definition of small group plans was to lower premium costs and to increase mandated benefits to a larger portion of the population. The lower cost theory was based on the premise that broadening the risk pool of covered individuals within the small group market would spread the costs over a larger population, thereby reducing premiums to all. However, after further scrutiny and comments, there was concern that the expanded definition would actually increase premium costs to the mid-size segment because they would now be subject to community rating insurance standards. This shift to small group plans might also encourage mid-size groups to leave the fully-insured market by self-insuring – a move that could actually negate the intended benefits of the expanded definition. Another issue with the ACA’s expanded definition of small group plans was that it would have resulted in a double standard for the mid-size segment. Not only would they be subject to the small group coverage requirements, but they would also be subject to the large employer mandate because they would meet the ACA’s definition of an applicable large employer. Note: Although this bill preserves the traditional definition of a small employer, it does allow states to expand the definition to include organizations with 51 to 100 employees, if so desired. Employer-sponsored health insurance is greatly affected by geographic region, industry, and employer size. While some cost trends have been fairly consistent since the Patient Protection and Affordable Care Act (ACA) was put in place, United Benefit Advisors (UBA) finds several surprises in their 2016 Health Plan Survey. Based on responses from more than 11,000 employers, UBA announces the top five best and worst states for group health care costs. Watch this short video and contact us for more information about the Survey! Many employee benefit limits are automatically adjusted each year for inflation (this is often referred to as an “indexed” limit). UBA offers a quick reference chart showing the 2017 cost of living adjustments for health and Section 125 plans, qualified plans, Social Security/Medicare withholding, compensation amounts and more. This at-a-glance resource is a valuable desk tool for employers and HR practitioners. 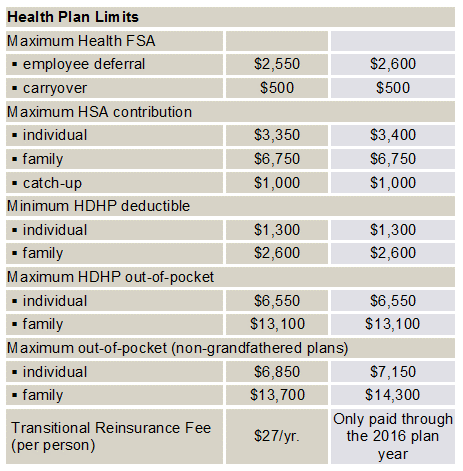 Here’s a snapshot of a section of the 2017 health plan limits; be sure to request the complete chart from a UBA Partner. The Patient Protection and Affordable Care Act (PPACA), commonly called the Affordable Care Act (ACA), included various mandates to ensure all citizens have affordable coverage for health care expenses. There is a mandate at the individual level and then other mandates at the employer level. Individual Shared Responsibility Mandate: This mandate requires all citizens to have minimum essential coverage (MEC). If they do not, they must qualify for an exception or they will be subject to a penalty. Individuals use the 1095 forms, or a similar statement, to document that they have the required coverage. Employer Shared Responsibility Mandates: These mandates apply to group health plans. One requirement is that all plans that provide MEC must report who is covered by their plan. There are also requirements which only apply to employers that are considered to be an applicable large employer (ALE), which is defined as any employer that employed, on average, at least 50 full-time employees. These requirements mandate that all ALEs must provide MEC to their full-time employees and this MEC needs to be affordable. If they do not provide MEC, they could be subject to a penalty (sometimes referred to as the “A” penalty). If the MEC they provide does not meet the definition of affordable, then the ALE could be subject to a different penalty (sometimes referred to as the “B” penalty). In general, the objective of 1094/1095 reporting is (1) to verify those individuals who had the required MEC; and, (2) to make sure ALEs are offering affordable MEC to their full-time employees. If this isn’t happening, 1094/1095 reporting provides the information necessary for the IRS to know whether a penalty to the individual, or to the ALE, is in order. Situation 1: the plan is fully-insured. It is the insurance carrier’s responsibility to file the 1094/1095-B with the IRS. Situation 2: the plan is self-insured and you are not an ALE. It is the employer’s responsibility to file with the IRS. In these situations, a Form 1095-B is to be generated for all covered individuals regardless of employment status. Form 1095-C provides evidence that an ALE offered, or did not offer, affordable MEC to all full-time employees. In other words, it documents whether an ALE met the employer shared responsibility requirements. For self-insured ALEs, Form 1095-C also provides documentation that an individual had MEC, thereby meeting the individual shared responsibility requirement. Because, in some situations, this form reports on both the employer and the individual shared responsibility mandates, it can feel nonsensical at times. To make sense, a short history lesson may be helpful. When the proposed reporting regulations were first released for comment, the 1095-B was to be used for individual shared responsibility reporting and the 1095-C was to be used exclusively for employer shared responsibility reporting. As such, the 1095-C was only a two-part form with Part I being employer identification information and Part II being information on the offer of coverage that was made to full-time employees. If the reporting forms had remained as initially proposed, self-insured ALEs would have been required to make two filings (the 1094/1095-B filing and 1094/1095-C filing). Why? Because they have a responsibility to report everyone that has MEC through their plan and they also have a responsibility to report on the offers of coverage they made to full-time employees. Debate over this double filing requirement ensued and ultimately resulted in change. This change eliminated the double filing requirement for self-insured ALEs by revising the 1095-C. The resulting form still has Parts I and II referenced above, but it now also has Part III where employers can report the individual coverage information that was originally proposed to be reported on the 1095-B. Situation 1 – Fully-insured Health Plan: You will complete Parts I and II for all individuals that were full-time employees at some point during the year. Part III information will be reported by your insurance company on Form 1095-B. Situation 2 – Self-insured Health Plan: You will complete Parts I, II and III for all individuals that were full-time employees at some point during the year, as well as for individuals that have MEC through your plan. Situation 3 – No Health Plan: If you are an ALE with no health plan, you will complete Parts I and II for all individuals that were full-time employees at some point during the year. The 1095-C is required of all ALEs. The 1095-C is a three-part form. Part I captures employer identification information. Part II is the area used to report what offers of coverage were made and whether or not those offers were affordable. This part addresses the employer shared responsibility mandates and determines whether or not employers are at risk for an employer penalty. Part III, which only gets completed if you have a self-insured plan, is the area used to report who had MEC through your plan. This part addresses the individual shared responsibility mandate and determines whether or not an individual is at risk for an individual penalty. Keep in mind, if you have a self-insured plan, a Form 1095-C is required for all full-time employees, as well as anyone who had coverage through your plan, so there may be situations where you are required to produce a 1095-C for individuals that do not meet the ACA full-time employee definition that identifies those employees for whom you have an employer shared responsibility requirement. In these situations, Part II can cause concern, or an initial fear, that a penalty could be assessed because these individuals may not meet the affordability requirement. Remember, these individuals do not meet the full-time definition, therefore, they cannot trigger an employer shared responsibility penalty. That’s 1095-B and 1095-C in a nutshell, albeit a very large nutshell. Although there are still a lot of crazy characters associated with ACA reporting, perhaps this has shed some light on the dark hole you may feel like you fell into and, hopefully, you can parlay it into a smoother reporting process in the new year. Happy reporting! UBA has created a template letter that employers may use to draft written communication to employees regarding what to expect in relation to IRS Forms 1095-B and 1095-C, and what employees should do with a form or forms they receive. The template is meant to be adjustable for each employer, and further information could be added if it is pertinent to the employer or its workforce. Employers can now request this template tool from a local UBA Partner. These final regulations are effective on December 30, 2016. These final regulations apply beginning on the first day of the first plan or policy year beginning on or after January 1, 2017. Short-term, limited-duration insurance is a type of health insurance coverage designed to fill temporary gaps in coverage when an individual is transitioning from one plan or coverage to another plan or coverage. Although short-term, limited-duration insurance is not an excepted benefit, it is exempt from Public Health Service Act (PHS Act) requirements because it is not individual health insurance coverage. The PHS Act provides that the term ‘‘individual health insurance coverage’’ means health insurance coverage offered to individuals in the individual market, but does not include short-term, limited-duration insurance. On June 10, 2016, the Departments proposed regulations to address the issue of short-term, limited-duration insurance being sold as a type of primary coverage. THIS IS NOT QUALIFYING HEALTH COVERAGE (‘‘MINIMUM ESSENTIAL COVERAGE’’) THAT SATISFIES THE HEALTH COVERAGE REQUIREMENT OF THE AFFORDABLE CARE ACT. IF YOU DON’T HAVE MINIMUM ESSENTIAL COVERAGE, YOU MAY OWE AN ADDITIONAL PAYMENT WITH YOUR TAXES. The revised definition of short-term, limited-duration insurance applies for policy years beginning on or after January 1, 2017. Because state regulators may have approved short-term, limited-duration insurance products for sale in 2017 that met the definition in effect prior to January 1, 2017, HHS will not take enforcement action against an issuer with respect to the issuer’s sale of a short-term, limited-duration insurance product before April 1, 2017, on the ground that the coverage period is three months or more, provided that the coverage ends on or before December 31, 2017, and otherwise complies with the definition of short-term, limited-duration insurance in effect under the regulations. States may also elect not to take enforcement actions against issuers with respect to such coverage sold before April 1, 2017. Kathy! You are amazing! I was speaking with Dr. Abel today re a patient and on his own he brought up how you were able to fix his wife and daughter’s insurance in less than 24 hours AND you were so NICE and PROFESSIONAL. He then said you were AMAZING. I absolutely love working with you, Ron, and the entire gang! Just wanted to pass this on - and again thank you for all you do for us!!! !